Streaming is a big deal nowadays in the gaming world; what used to be boring and weird, watching someone else play a videogame, is now something that millions of people spend their free time doing, often watching their favourite Twitch / YouTube celebrities gaming. 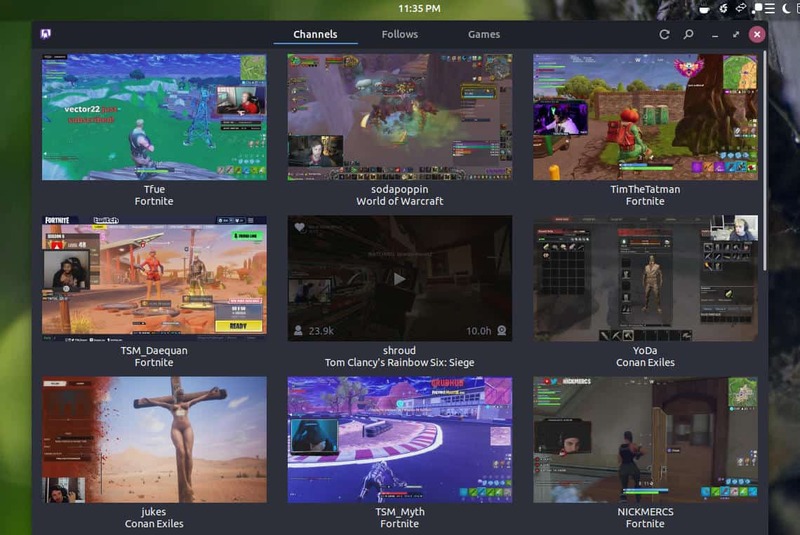 While there is a Twitch application available for Windows and Mac users, there isn’t an official one for GNU/Linux users – but there is an unofficial one: GNOME Twitch. Linux users may watch streams on the official Twitch website using their favorite web browser, or use GNOME Twitch to do so. Installation of GNOME Twitch is easily accomplished in a variety of distributions. If you’re using a distro that makes use of flatpaks (most) then follow the simple instructions found here. Arch/Manjaro users can find gnome-twitch in the AUR. The GNOME-Twitch application is pretty barebones, whether that’s for the better or not is up to you to decide. On the main screen that you’re faced with when the program opens, are the top streams being watched at the time. I will say that I’m quite happy with the way that the UI is sized, the large thumbnails and font, etc., are rather easy on the eyes. At the top of the screen are three buttons: Channels, Follows, Games. These are how you’ll find, whatever it is you’re looking for, save direct searching. Channels being the top streams, Follows will show you any streamers that you follow, and Games will show you the top games ranked in order. In order to log in (this took me a minute to figure out...Maybe my fault for missing it, maybe bad UI design? You decide) you’ll find a small Twitch logo in the top left corner of the application. That’s a button. Clicking the button will bring up a small menu where you can log in to your Twitch.tv account, as well as go to the settings menu, show the ‘About’ screen, and the quit button; very straightforward. I personally don’t spend a great deal of time watching streams, but it has been growing on me more as of late, and the addition of GNOME-Twitch is nice for when I don’t need my browser, and just want to kick back and throw on a stream. The software was lightweight on my Ubuntu 18.04 Budgie system, streams ran smoothly, and I personally liked the minimal UI (with the exception of the button in the top left, not being obviously a button, to me.) Whether this entices me to watch more streams, time will tell! Now you: Do you enjoy watching streams? Do you use your browser, or a desktop application, and why? Let us know in the comments! why would you use this instead of Streamlink Twitch GUI? GNOME Twitch is somewhat more lightweight and the UI lags less. It also feels more native in terms of looks, if you happen to be on GNOME, and does feel more native in terms of UI navigation pretty much anywhere. Streamlink Twitch GUI often feels like it’s a single-purpose web browser (because that’s what it is technologically), with half the navigation being done through the back-button. Another reason might be that you can’t get the dependencies together for Streamlink Twitch GUI. I remember not being able to find some Python Crypto library for Streamlink itself on openSUSE. But yeah, Streamlink Twitch GUI has lots of advantages over GNOME Twitch, too. It feels more Twitch-native, often just rebuilds what the webpage does, has things like channel descriptions etc.. It has a lot more settings, including some pretty good options for filtering out channels that are in languages you don’t understand and so on. It also happens to look more native under KDE Plasma, even though it’s not at all built on similar technologies. No, I don’t watch. Although I understand that they’re interesting to many people, I don’t understand why. If it’s a game I like, then I want to play it, not watch someone else play it. But then, I never really understood the appeal of watching other people play sports, either. Nice! I like to watch streams while doing other things, usually in other programs, so it will be nice to not have to use a memory-heavy browser.